The Situation: Nobody predicted the scope of the 2007-2008 financial collapse. Customers were panicking, and each day money poured out of Fidelity and all financial services companies. Convention dictates that a leading financial services company, with a depleted ad budget, shouldn’t launch a completely new and different advertising campaign. Yet, Fidelity did with a compelling, problem-solving financial GPS device (otherwise known as “The Green Line”) to help ease consumer’s financial concerns by giving directions and acting as their literal financial guide. The challenge was to spread the message that Fidelity could offer customers the personalized guidance they wanted in a way that transcended the category norm and straddled both the economic crisis and the eventual recovery. Facing a new consumer landscape filled with multi-tasking and ad-avoidance, a roadmap was created that literally connected consumers to Fidelity, brought the Green Line GPS to life and integrated it into the consumer’s sports passions. Insight and Strategic Approach: In a time when reputation mattered, Fidelity had the highest levels of perceived “trust” in the industry. But, trust wasn’t enough. Investors wanted personalized guidance. All of Fidelity’s customers have access to a licensed advisor, free of charge, 24/7. It may not always be the same person, but they can rest assured that all Fidelity representatives follow the brand’s core investing methodology – conservative, disciplined investing. To convey this message with a personal touch, we showed that investment advice from Fidelity came from a company, not just one advisor. Fidelity was acting a lot like customers’ financial GPS– even if the path changed along the way. Armed with that insight, the goal was to show how Fidelity customers could follow the disciplined investment advice they’ve been given. Media Tactics: Fidelity became an investor’s financial GPS navigator. The company’s simple, iconic, green line became the visual metaphor of how Fidelity gives consumers the guidance necessary to meet their goals. “Turn here” became the new message, capturing the way Fidelity works to create a specific plan for each customer. Media tactics using the green line centered on newly created and relevant content integrations that fused Fidelity’s investment strategies with editorial. Additionally, the GPS was integrated into the opening of the Gameplan Guidance segment covering Olympic Hockey on NBC (one of the country’s top networks) and within resort guides across the US tying to the consumer’s affinity for skiing (targeted affluent resorts with RSN network). Print In a series of firsts, the “Green Line” became a Table of Contents (The Week), a museum guide (Smithsonian) and a golf caddy (Golf Magazine). Online In a media-first, the “Green Line” was featured as a custom skin on Golf.com and acted as an actual GPS for guiding users through a picture gallery of events on Golf.com. OOH In this space, the “Green Line” became a travel guide across stairways and escalators at busy airports. 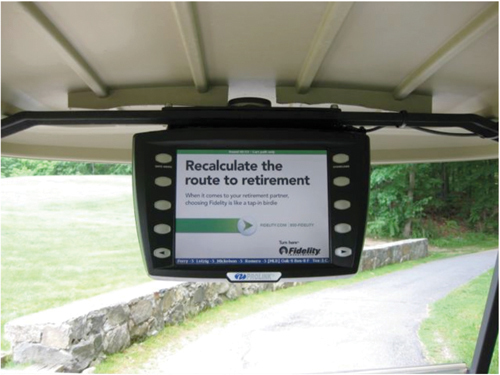 Actual green line GPS calculators were installed on golf carts across courses nationwide. To dramatically change consumer perception and restore their trust with Fidelity, we moved beyond the :30 spot and directly linked the brand message to the media and to the viewer, all while reinforcing the brand proposition in a way that no “ad” could. By switching from Fidelity’s traditional messaging that focused on investment philosophies to actually showing consumers to follow (and trust) in Fidelity’s guidance, we made consumers feel as though Fidelity was giving them the personalized guidance they wanted while at the same time strengthening the level of trust in the brand.